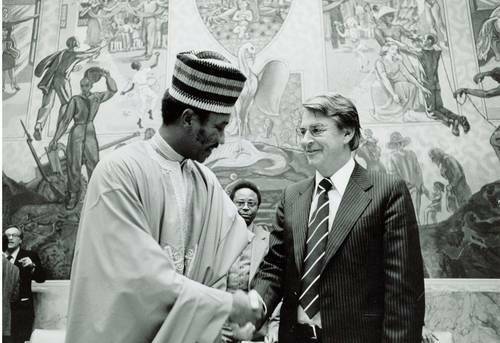 Donald Woods (right) being greeted by the President of the Security Council, Brigadier Joseph N. Garba, Commissioner for External Affairs of Nigeria, United Nations, New York. Woods was the editor of Daily Dispatch in East London, South Africa. He was critical of the apartheid government and, originally of the Black Consciousness movement. Through Mamphela Ramphele he met Black Consciousness leader Steve Biko. Woods became friends with Biko and began writing editorials in support of Biko's activities. In September 1977 Biko was arrested, imprisoned and beaten to death. Woods went to the morgue and photographed Biko battered body. The photos discredited the government's account of Biko's death. Woods was banned in 1977 for his persistent campaign in the Dispatch to hold the government accountable for Biko's death. He fled South Africa in early 1978 disguised as a priest. Woods spoke against apartheid in London and toured the U.S. supporting sanctions. He wrote a book Biko that served as the basis for Richard Attenborough's movie "Cry Freedom." At the request of the African states, he testified before the Security Council on apartheid on January 26, 1978. He was the first private citizen to testify before the Security Council.